The ubiquity of this custom can be credited to the Kabbalists, specifically Rabbi Isaac Luria, known as the the Arizal (1534–1572). The purpose of tefillin is to bind our mind and emotions to G‑d. The mind is represented by the tefillin of the head, and the emotions are represented by the positioning of the arm tefillin near our hearts, the seat of emotion. Devoting our emotions to G‑d—i.e. developing a love and awe for the Creator— impacts our behavior; thus, the emotive tefillin are placed on the arm, which symbolizes action. 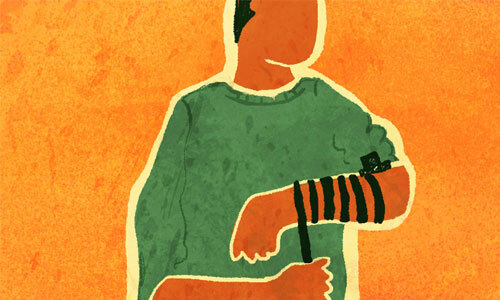 For more on the mitzvah of tefillin, visit Tefillin and Its Significance. 1.Even those who appear to wrap eight times are essentially conforming to this custom. 3.Pri Etz Chaim, Shaar HaTefillin 10; Shaar HaKevanot, Tefillin 5; Olat Tamid, p. 34b. 4.They are the angels Michael, Gabriel, Raphael, Uriel, Tzadikel, Uphiel, and Raziel. 5.Zohar Chodosh, Shir Hashirim 64a; see also Igra D’parka 109; Brit David p. 120; Maaseh Breishit, vol. 3, p. 10. 7.Mavo l’Torat Chassidut (Ekstein), p. 108; Al Avoteinu V’al Yechusom, p. 73. 10.Reishit Chachmah, Shaar HaKedushah, ch. 6. 13.See Aruch Hashulchan, Orech Chaim 27:19. 14.Shulchan Aruch Harav, Orech Chaim 51:8. 16.Divrei Yechezkel Hachadash, p. 319. 18.Otzar Kol Minhagei Yeshurun 65:4, citing the Sefer Maaseh Ilfas; Sefer Brit David, p. 121. 20.Tiferet Yisroel (Fishman), p. 338. 21.Ner Mitzvah (Meshash), p. 188; see also the Sefer Sod Chashmal, p. 78, 345. As taken from, http://www.chabad.org/library/article_cdo/aid/479863/jewish/Why-Wrap-the-Tefillin-Straps-7-Times.htm on August 1, 2017. Previous Post WHO IS THE SOVEREIGN ON TEMPLE MOUNT?